From this tutorial you’ll learn how to utilize Circle Progress JetElements module style for Elementor. Background Stroke Type — here you can define the type of the stroke to use for the background outlines of the circle progress bar. It can be Classic or Gradient. Choose the one that is more suitable for you. 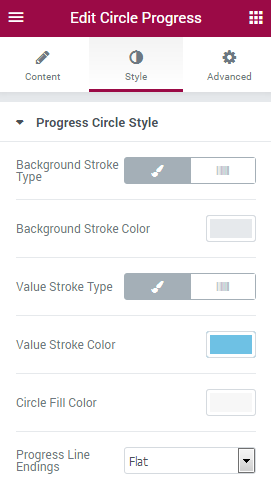 Background Stroke Color — here you can define the color to use for the background outlines of the circle progress bar. Background Stroke Color A — here you can define the first color to use for the background outlines of the circle progress bar. Stroke Color B — here you can define the second color to use for the background outlines of the circle progress bar. Gradient Angle — here you can define the angle between first and second gradients. Stroke Color — here you need to specify the color for the outlines of the completed progress. Value Stroke Color A — here you can define the first color to use for the outlines of the circle progress bar. Color B — here you can define the second color to use for the outlines of the circle progress bar. Circle Fill Color — here you need to specify the color that will be shown inside of the circle progress bar. Progress Line Endings — here you need to define, if you want the progress stroke line endings to be sharp or rounded, more smooth. Style settings for these three blocks are similar. Color — here you can define the suitable color for the Circle Progress module elements. Use color picker tool to select the necessary color. Size — define the font size of the Circle Progress module element. Family — here you can set the font family for the Circle Progress module element. Transform — here you can choose from the dropdown menu, if you want the Circle Progress module element to be shown in uppercase, lowercase, capitalize or normal way. Line Height — in this field you can set the height of the Circle Progress module element lines.